In The Times this morning, an item suggesting that blossoming in the New York City parks will be unusually overlapping this season. I remember this from certain springs. In general it would be so carefully painted in Central Park – first the yellow forsythia, then delicate whites and rose of cherry and dogwood, then the heavier magnolias. But that occasionally these would run together. The effects could be beautiful, but sometimes I remember thinking that the palettes jarred, and that I preferred the slow procession, each tree gravely taking its turn to step forward. Here, though, we long for spring, hurried or deliberate. Three brave clusters of dark purple crocuses in our yard, in a particularly sunny and warm place close to the house, are the only flowers I’ve seen. Today, when the baby and I went out to the country for a walk, we saw forsythia so tight and ashen that it seemed weeks away from bloom. Staring now out the study window, by dint of straining, I can begin to pretend that the faintest shade of yellow-green limns the edges of the severely closed branches. 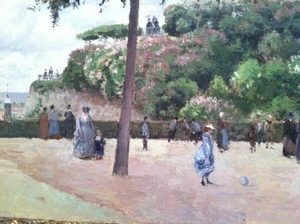 Struggling to recall the sensations of public parks in spring, I was put in mind of a Pissarro I looked at last year at the Met. 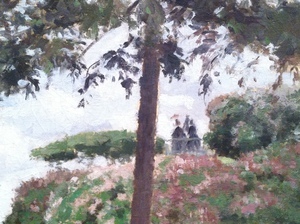 The Public Garden at Pontoise painted in 1874. Perhaps those massed bushes would be rhodedendrons? And lilacs? The people do not seem especially joyful – their faces are deliberately not given in detail. But they move about in an air that is full of leaves and flowers, and the people, too, look at the coming-and-going clothes of the boy on the left, are not bound tightly anymore but are carried by the fullness of spring. And when they climb to the heights of the hill to look out across the water, the light among the treetops is radiant. Quotation from Pissarro, Letters to his Son Lucien, edited by John Rewald and translated by Lionel Abel, p58. In New York in the fall, making my way through the reorganized back rooms of 19th century European art at the Metropolitan Museum, I was pleased by two landscape recoveries. Wonderful oil sketches by Constable that used to hang scattered in obscurity, somewhere past the Corots, have been hung together, with prominence. And three Daubignys, for many years unviewable, now hang in a row, constituting a quiet assertion, long missing at the museum, that this is a painter worth contemplating. Constable and Daubigny are tied together in various ways. An important exhibition of Constable’s oil paintings at the Salon de Paris in 1824 had an impact on the French landscape painters who were to become the Barbizon School, of which Daubigny was a part. Daubigny himself would have been seven years old at the time of this exhibition, but other contact with the work of the great British landscape painters was of significance for him at several key moments in his development. The phrase “as they see her,” could be put into the present continuous to bring out something of the painters’ particular quality – as they are in the act of seeing her. These two, I think, have an unusual genius for making the viewer feel the air. Two of the works I studied at the Met may help me to try to say what I mean. 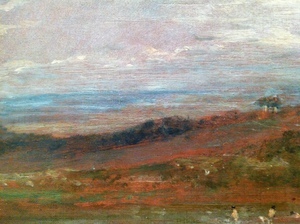 John Constable’s oil sketch “Hampstead Heath with Bathers,” was one of about a hundred such sketches that he made in that rural location in 1821 and 1822. 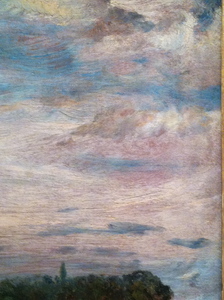 The museum text also points out that Constable “often included a strip of land to contribute a sense of scale and depth.” This sounds technical, even mechanical, as if it describes a scientific manual that overlays diagrams with little black stripes of measurement. But here, actually, is no mere strip of land, but a protected cove for bathers who are to be seen standing waist-deep in the water. The feeling of the sketch (it is a small one, slightly less than ten inches by a little more than fifteen) is that one is oneself wading in the water while the vast sky rushes overhead. 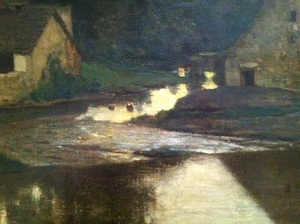 In the Daubigny, as in the Constable, figures come to water. 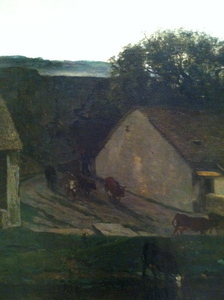 But in the Daubigny our imagination makes us not bathers, but someone who watches the cows returning to the village in the evening. I’ve had a few conversations recently with people who are not that interested in painting. They say, reasonably, that in museums they are overwhelmed by the profusion, or that only really contemporary painting is strange enough to compel their attention, or that in front of paintings long and loudly admired their eyes feel veiled by expectations and history. It feels odd to say in the face of these large and genuine concerns that when I am at a museum I am often merely after a small, fine sensation. The movement of light and air. That’s all. I know this feeling is of a family of quite ordinary feelings – on a good day one may have something like it walking to the grocery store. But, though common in life, it is rare in art. In very great literature, “But, soft! what light through yonder window breaks?” But not, for example, in photography. It might be almost a definition of what distinguishes painting from photography that one does not feel the movement of the air in looking at photographs. Even in front of Ansel Adams, what one feels is majesty, not air. But in front of a painting the movement of light and air have held someone else’s attention in a way that lets me feel it and at the same time know myself to be feeling it. 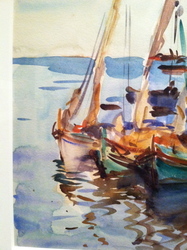 The presence of the Sargent watercolors in Boston this season has focused my attention on how it is that painters offer this sensation to us. 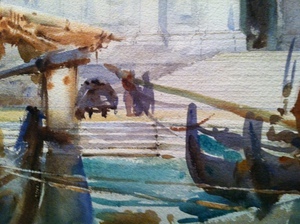 Why, looking at Sargent’s quick-stroked boats along the edge of a Venetian canal do I suddenly feel the soft air? My guess is that this sensation is one of the aspects of seeing paintings in person that cannot be rendered in iphone details, but I’m going to try to illustrate what seem to me to be two sides of the answer. It seems first of all to have to do with things jostling and overlapping. The two gondolas to the right here are at rest, but must be bumping each other. The figures standing on the stone are, in action, distinct but are shown overlapped by the long greenish boom of a boat, and the figures themselves and their shadows bleed into one another. 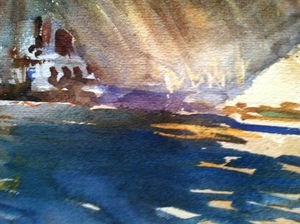 Boats, water, Venice, all ideal for this because it is not in any of their natures to be still. We know the light reflected on the underside of the bridge to be dancing, as are the waves given in motion below. 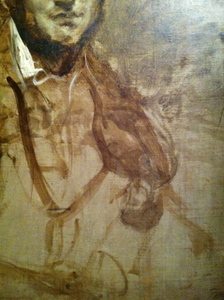 Jostling, overlapping, playing over, this gives the sense of motion, permeability, change, within the picture. On the other side, the angle and motion of the viewer are also significant. Look at these two shots, almost identical of Portuguese Boats. I think that the sense of motion comes across better in the photo to the left, taken at a slightly stronger angle, then in the flatter front-on one to the right, in any case, shifting rapidly between the two may give something of the sensation. The shift makes a small suggestion of how one sees the picture as one is oneself in motion. Of course when you see a painting in person you cannot help but move in front of it, if only to walk up to it. The spatial experience of a photograph changes much less as you move around in relation to it. I suppose because of the fixed position of the camera. The painter is constantly moving around in relation to her canvas and constantly changing the perspective. It must be the sense that space is changing around you that you have when you walk to the grocery store. 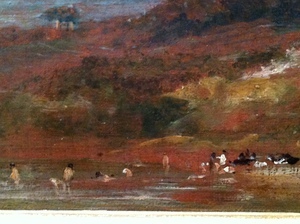 Landscape with Ducks, Metropolitan Museum. 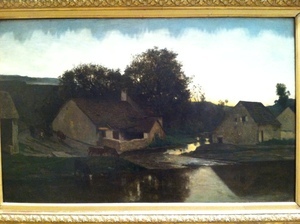 For a long time when I went to the Met with a feeling for Daubigny, I went to the basement. 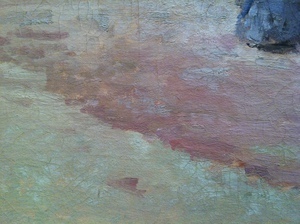 Although the museum owns thirteen paintings by Charles-François Daubigny, only one was on display, a part of the Robert Lehman Collection, itself displaced during years of construction. 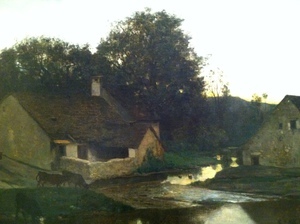 The painting was of an evening scene by a river. Across the river were two small figures, women, I remember them as washerwoman. Nearer, and more prominent, a line of dark ducks who swam purposefully toward their evening’s rest. Nearer still, three birds on the bank, who have already settled. The sky’s tints of yellow and rose, seen again in the river’s last reflective shades make of the whole that tranquility one feels in the evening, lingering in its harmonies before returning home. The Daubigny hung in a dark area, sort of an alcove made with temporary walls, alongside a Corot, and not far from a surprising Degas of some quite orange rooftops. Sometimes, uncertain about my own pleasure, I would look at the Landscape with Ducks and think 'it's too quiet, too pink,' and point out to myself that there didn’t seem to be a compositional difficulty, a challenge to go on thinking about. At other times, taken with its feeling for life, and the way the sky and space open up as sky and space really do, with a sense of air and moisture and of people and animals moving about, with the power of the yellows and the darkened trees, these questions didn’t worry me. The seeming easiness of seeing Daubigny is part of the difficulty of seeing him and this has to do with history as much as it does with his gentle, unassuming canvases. 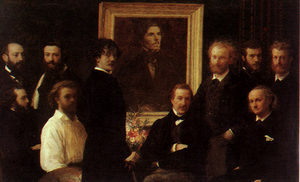 He was a part of the Barbizon school, at the time a group of innovative painters (Corot, Millet, Rousseau), who didn’t agree with the Academy that the only worthy subjects were regal men and women in neo-classical poses painted with exacting, lugubrious accuracy. Daubigny was actually the only one among the Barbizon painters to regularly paint outdoors, and he even constructed a barge studio in which he painted while drifting down the Oise, but all of them sketched outdoors and brought the refreshing plein air of nature into their work. These were mentors and models who mattered enormously to the Impressionists who came fast on their heels and, with their more radical innovations, soon eclipsed their Barbizon peres. The rapid succession of changes made Daubigny and Corot something of a short link in the chain, easy to pass over in favor of what came after. The Barbizon paintings were loved by dilettante American collectors, and it became a badge of honor among the new critics of the 20th century to despise these works. 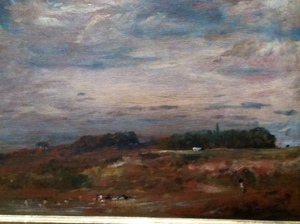 Daubigny himself was overshadowed by the greater scope and popularity of his close friend Corot. 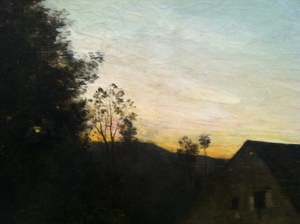 Still, I thought that after the great Corot show at the Met in 1996-7, more interest in Daubigny would soon follow, but he goes on being very difficult to get any sense of. About four years ago at the Musée d’Orsay (which holds nineteen Daubigny paintings), I asked at the information desk if any of them were seeable. The man at the desk seemed somewhat surprised as he paged through the records on his computer to discover that they were all either in the “fonds,” in storage, or loaned out to the regional museums in the French system. All except La Neige, of course, and that one we both knew well. The only really prominently displayed Daubigny is his astonishing Snow, sometimes called Winter, painted in 1873, a year or so before his death. Long a supporter of the Impressionists (he stood up for their paintings at the Academy and introduced them to Durand-Ruel, who would be their gallerist and champion), Daubigny was, as he matured, not afraid to be affected by the work of these younger men. More than any of their other predecessors, he might fairly be called a late-blooming Impressionist himself, and a few of his late works have a force and power and idiosyncrasy of vision comparable to those of the much better-known Impressionists. It is hard to convey the impact of La Neige with a reproduction on a screen. It is a very wide painting, hung low, and it hits you in the chest when you see it. The desolation, and the exhilaration of a winter landscape in the shortest days of the year. The mood like being in a Thomas Hardy novel: you’ve walked all day, your feet are cold and damp. You come upon a great field of crows having their sociable end to the day, calling out news to one another as they step briskly about on the damp ground, landing in the trees they share as nighttime roosts. The sun is almost down and in the thick gray sky, a few clouds are of a sudden lit, a dash of rose. The long stretch of drab white snow, the mud showing through, bits of broken grass, the sense of the road, the heavy talkative presence of the birds, the thick cold sky. No one has ever done this better. And yet we hear almost nothing of Daubigny. Renoir to me has always been the outlier – the one among the Impressionists without austerity enough to make room for me. Too sweet, too voluptuous. All skin, no air. 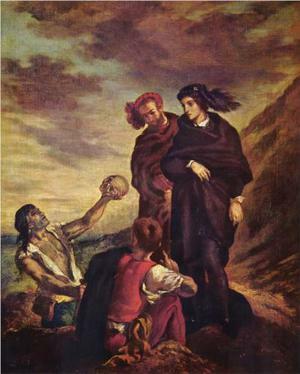 But loved by Leo Stein, Gertrude’s brother, who understood Cézanne’s apples right away. 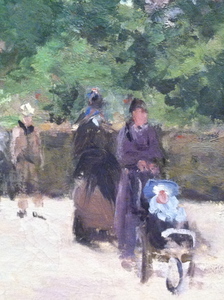 When he and Gertrude split up the household they had for decades shared, both wanted the apples, but were content for her to keep the Picassos, him to take the Renoirs. Stein was a man for whom sensuality was difficult and I’ve wondered if Renoir seemed to offer in an uncomplicated way, enjoyment. It sounds from the memoir written by the son, Jean Renoir, as if the painter was a rare person, fundamentally tolerant of himself and of other people. It’s true that his paintings show people taking pleasure in life. Who else does that? Perhaps some Dutch painters, though there is often a suspicion that Frans Hals is laughing at his revelers. In Renoir they take a quiet pleasure. Jean Renoir says the sitters have “serenity.” They are settled, but they are still full of the activity of being themselves; they look out on their surroundings and see much to interest them. 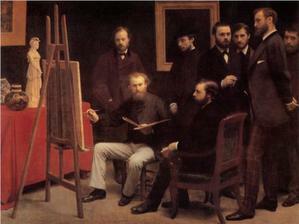 When the son spoke to the father of different women he had admired and painted, a great variety of women, society ladies and street walkers, the painter was full of appreciation, his greatest commendation, “she posed like an angel.” In the portraits, the sitter and the painter seem to share a lively and devoted understanding. 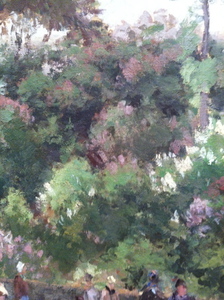 There is a Renoir of Monet in a garden painting. I wondered when I saw the reproduction recently if it were a Renoir or a Monet. The flowers have a lot of whites reaching upward in a way that I thought might be Monet, but when I checked the back flap I was not really surprised to see that it was a Renoir. 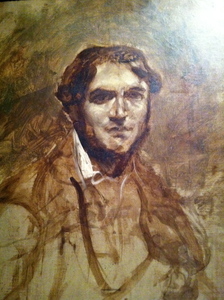 The way to tell would have been to look at the figure, the painter in his hat, all his energy turned toward his craft. Features, soft, almost indistinct, but the impression of the face is of concentration and happiness. He could be humming. In a state of happy engagement people are very close to the surface, much closer then we usually are able to be even with close friends, whose faces barricade them in reserve. Perhaps what I have taken for too much luster, too much skin, is really more unsettling, the close presence of people in a state to which we are no longer accustomed, as we may find the unsanitized smells from earlier eras – a barnyard, a field of clover, dried lavender in sheets – overwhelmingly, almost intolerably, sweet.